At my work we have a breakfast club. So that every Friday some one brings in breakfast. It's not mandatory but a lot of people do participate. So because so many people participate you only have to make breakfast 3 or 4 times a year. So I use this time to test out new recipes and it gives me an excuse to not serve the same thing twice. So I had made this cake before but before I started my blog so I figured why not make it so that I can post it. 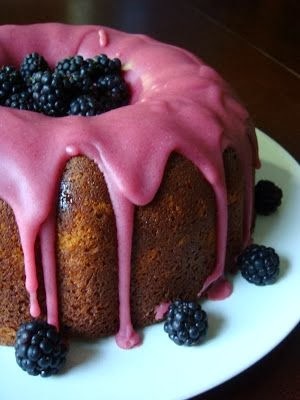 I really like this cake, its slightly spicy and has a hint of blackberry flavor. It's always a crowd pleaser and it transports very well. Not to toot my own horn but my breakfast day is highly regarded as the best breakfast day and everyone looks forward to it. So I must impress. And this cake does the trick.